Artist Wang Haichuan's solo exhibit in Shanghai to showcase a variety of his artworks. 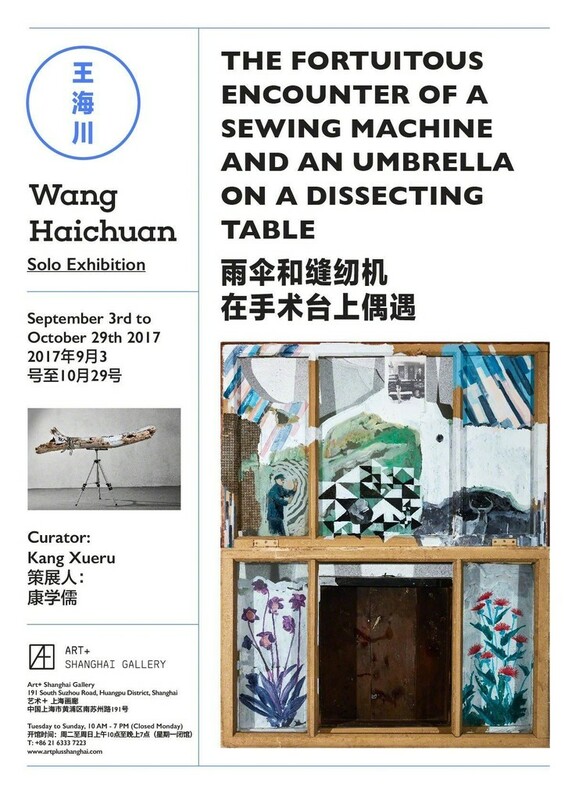 Chinese artist Wang Haichuan's solo exhibit at Art+ Shanghai Gallery gets a mouthful of a title ("The Fortuitous Encounter of a Sewing Machine and an Umbrella on a Dissecting Table"), which somehow fits the broadness of the exhibit itself. Opened on September 3, the exhibit "displays works in various media that are unified in their defiance of genre expectations, their eclectic imagery, and their examination of societal patterns and individual psyches." For more information on the artist and his artworks, visit the gallery's website here. The past decade of Wang Haichuan’s artworks is rich and complicated, including painting, installation, photography, videos and on-site performances. the art project he spends year doing is still under progress. It concerns the most pressing socials issues in China. In this exhibition, we present his unique and meaningful art creation through his paintings. The first lies in his use of composite, which is very obvious. The artist puts different images under the same frame based on visual needs, his story or some fleeting feeling. This is relative the core concept of his paintings, that is those chosen images are deprived of prototype meanings and gain a kind of liberating power. They run away from previous meaning and concepts, get another identity and meaning in their new images, or become pure forms, indispensable forms of the paintings. His second feature is the unique colors he creates with Tibetan paper. This special handmade material from Tibet is simple, hypoechoic and absorbs water very well. Wang Haichuan always uses other colors as a base and then paints on it, which makes those colors lack purity and the whole picture deep and thick. Of course, this also has to do with his uses of gray and historic images and old photos. The third feature is his incomprehensible contents. Uncomprehensible is an obvious trait of today’s artwork or it is the standard of modernist art. Although we could tell some features of Wang Haichuan’s paintings, but what exactly is each painting saying or how exactly is each painting created is probably forever a secret. We could only see one piece of image after another and the gap between them, never fully grasp their meanings. This is why this exhibition takes its title from Lautreamont ‘s poem, The Chance meeting of a sewing machine and an umbrella on a dissecting table. Why an umbrella meets a sewing machine on a dissecting table by chance, we could never know. But we can see their images fabricated together, becoming a whole perfect painting.